Intel held a press conference last night focussing on the company’s efforts to appeal to the mobile technology market; smartphones, tablets and Ultrabooks. Within the presentation there were details of budget smartphone targeted “Lexington” Atom processors, details of the quad-core “Bay Trail” Atom SoC and news about a revised 4th generation Ultrabook spec that includes touch screens and wireless displays. Intel launched the Medfield line of Atom processors last year aimed at mid-market performance smartphones. This year it looks like the company is aiming at the cheap seats, at least to start with. The “Lexington” Atom processor-based platform and smartphone reference design is to be targeted at the “value smartphone segment”. Intel’s press release says that this segment will reach 500 million units by 2015. Mike Bell, vice president and general manager of the Mobile and Communications Group said “We believe the experience that comes with Intel Inside will be a welcomed choice by first-time buyers in emerging markets, as well as with our customers who can deploy more cost-conscious devices without sacrificing device performance or user experience”. This budget minded platform offers very good entry level spec as follows; 1.2GHz Z2420 hyper threading processor, 1080p hardware accelerated encode/decode, 5 megapixel camera, dual-SIM capability. 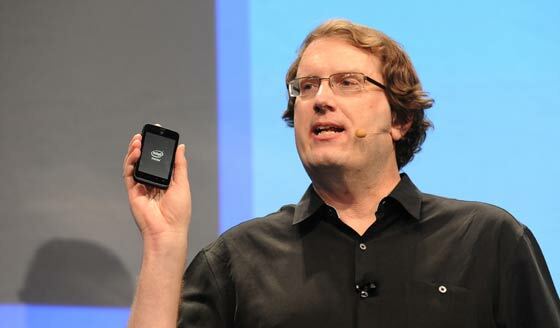 Mike Bell with the "Lexington"
Performance and mainstream smartphones will be catered for by the Intel Atom Z2580 processor platform (formerly "Clover Trail+"). Bell said that this “new platform will deliver up to two times the performance benefits over Intel's current-generation solution” with similar battery consumption. Many companies have tablets which are available, or coming out shortly, using the Atom Processor Z2760 running Windows 8. 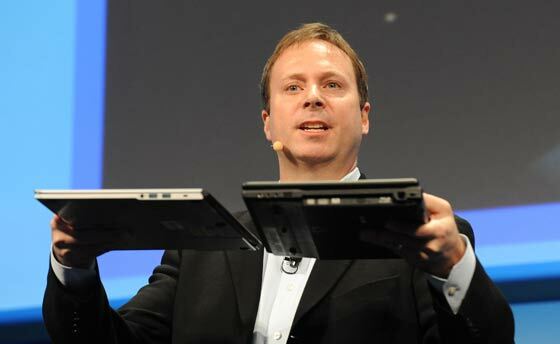 The CES presentation emphasised how Intel powered tablets offer the full Windows 8 experience while boasting “all-day battery life”. Also details of the next generation 22nm Atom SoC, codenamed “Bay Trail” were sketched out. This new Atom SoC is scheduled for “holiday 2013” and the quad-core Atom SoC will be able to deliver “more than two times the computing performance of Intel's current generation tablet offering”. Many Ultrabooks launched in 2012 looked great but were probably prohibitively expensive to shift in Intel’s desired volumes. Focussing on power consumption, Intel stated that a new line of 3rd generation Core processors are available now, operating as low as 7 watts, “allowing manufacturers greater flexibility in thinner, lighter convertible designs”. There are more than a dozen designs utilising these new processors already in development. “The 4th generation Core processors are the first Intel chips built from the ground up with the Ultrabook in mind” said Kirk Skaugen, vice president and general manager of the PC Client Group at Intel. “We expect the tremendous advancements in lower-power Core processors, and the significant ramp of touch-based systems will lead to a significant new wave of convertible Ultrabooks and tablets that are thinner, lighter and, at the same time, have the performance required for more human-like interaction such as touch, voice and gesture controls,” he said. Skaugen demonstrated a new Ultrabook detachable reference design (codenamed “North Cape”) that converts into a 10mm tablet and can run on battery for up to 13 hours while docked. Intel also showed a 3-D depth camera motion tracking interface. Also on the subject of interfaces, all 4th gen Ultrabooks will have a mandatory requirement of a touchscreen.